The Cube in Wodonga turned orange today as Helen Haines (@HelenHaines1) launched her #IndiVotes campaign with Cathy McGowan MP (Indi) (@indigocathy) and an army of supporters there in support. Haines told supporters her campaign is on track. This first phase of the campaign since the Voices for Indi forum has been about getting our orange team into place, and boy have we done that! Ten campaign hubs. Ten! Most of Haines’ supporters arrived early and caught up over a cup of tea with old friends from past campaigns. How many attended? I’m not good with numbers, but it was close to the same as the ABC/BorderMail candidates’ forum back in 2013 at the same venue. Voices For Indi, this time with Helen Haines, is again bringing a big ground game. I acknowledge the traditional owners of the land on which we meet: the Wiradjuri, Wavereoo and Dhudhuroa people and pay my respects to their elders past, present and emerging. I acknowledge 60,000 years of continuous culture and stewardship of this land. I pay tribute to the knowledge and strength of our First Nation’s People. I thank them for sharing their stories. I wish to acknowledge Dr Judy Ahmet for her beautiful welcome to country. Thankyou to the amazing Indi Makers! Thankyou to our extraordinary MCs — Jill and Des. I want to acknowledge and thank Brendon, John, Catherine, Georgia and Leo for their words of confidence and the stories they have shared. There is one thing I’m learning fast and that is when you become the candidate your past catches up with you and there’s not too many places to hide! I want to acknowledge the extraordinary Cathy McGowan. Cathy leaves an enduring legacy on the federal parliament of Australia. She was the first woman Independent to hold an Australian rural federal seat. Importantly she is widely recognised from all sides of politics to be someone of high values who put her electorate first on matters of policy and debate. Cathy held all politicians to a higher accountability by championing the Federal Integrity Commission — a move greatly supported by people across our nation. Her contribution to legislation has been significant. Cathy always put Indi first. She didn’t just walk into our halls of power: she threw open the doors and ushered in so many with her. She worked collaboratively with local and state government, community groups and individuals to bring about lasting improvements to our electorate. She took us to Canberra. Her work in eliminating more than 200 mobile phone black spots, championing Australian Rail Track Corporation and state government funding for the rail line, and the recent Regional Cities Deal are examples of Cathy’s capacity to work with and for our communities. Her work on the drought relief policy; her work for the things that mattered to individual people. Cathy McGowan: what a story. And to you I say — Welcome! All across Indi the word went out. The word went out that it’s on again in Indi. It’s on again for a third time. An event of Orange proportions to launch our campaign for a new community Independent to contest the federal election. And the people have come. Here you are! You have come out today to open the next chapter of a story that all of Australia is waiting to hear. Each of our stories begin well before us and include people both known and unknown to us. If we are lucky our story extends beyond us. I am, like each of you, the sum of my family, my community, the ecology of the places I have lived. My life story up until a few months ago was a pretty typical one for a country girl. Growing up on a dairy farm with my four brothers riding my bike to the little one-teacher school. Saturdays filled with tennis, footy and netball and Sunday afternoons billy-carting at our grandmother’s farm. Good seasons, bad seasons. Long bus rides into secondary school then leaving home to go nursing in the city. I found my way to Northeast Victoria via a V-Line ticket to Chiltern, with a handsome young ag scientist and the promise of adventure. I thought I’d give it a go — the ag scientist and the Northeast! 33 years later the adventure bit is really kicking in as I stand before this sea of Orange as your Independent candidate for the seat of Indi in the federal parliament in the forthcoming election. There are many parts to the story. In 2012 an adventure of epic proportions began when a small group of local citizens met purposefully in a side room at the Wangaratta Public Library. Not sounding too adventurous yet, they met to discuss what they saw at the time, at an all-time low in Australian political discourse and, closer to home, a style of representation in their federal seat that did not reflect their values, nor their sense of the broader values of their communities. Over a few more meetings they incubated their ideas. They decided to test if their gut was accurate and so they stepped out of the library and into kitchen tables across the electorate. The concept of being a ‘safe’ seat where nothing will ever change was challenged as a ‘truth’. A grassroots democratic movement was born. The nation was impressed but perplexed — how could this bunch of amateurs from rural Australia have pulled off the biggest electoral defeat in recent history? And then they did it again in 2016; and here we are again in 2019. I like many of you was part of the 2013 campaign. I like many of you was working in a busy job and juggling family, studies and community commitments. I didn’t think I could add political activism in there as well but I suspect like many of you I surprised myself. Like many of you I caught the bug, I felt the energy, I was inspired by the idea that this democracy belonged to all of us not just to the usual suspects in the major parties. I came to believe that here in Indi we didn’t have to accept that ours was a safe seat that could not be shaken. I like so many of you here today decided to rattle the cage; and so the story continues. 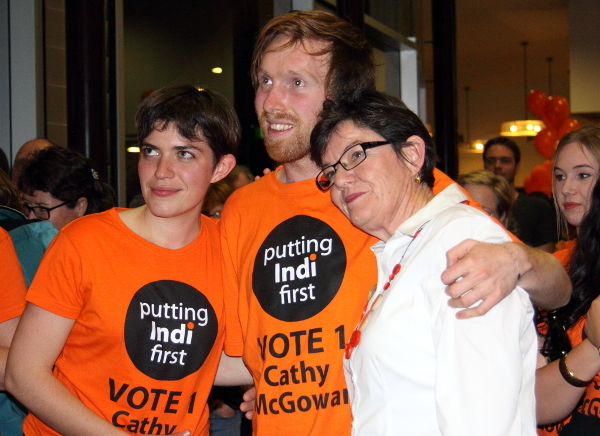 What began as a grassroots movement has grown beyond Indi. Across the land there are Voices for Farrer, Warringah, Mayo. We have learned that where there is a community will there is a community way. We are more confident now. We are more in charge now… and Canberra knows it. I STAND FOR an Indi with thriving, compassionate communities alive with opportunities for all our people young or old. An Indi with energised, engaged communities who come to together to solve problems, to find solutions which harness our diversity and are inclusive. A place to feel safe, a place to call home. I STAND FOR INDI a place that is seen by the rest of Australia as innovative, as brimming with leaders, as a place of ideas, as a place people want to come to learn and live. A place of strong agricultural enterprise, of diverse small businesses, of art and music, of food and wine, of cycling, of footy and netball, of bushwalking, skiing , of mountains and valleys. I STAND with a commitment to you to be a representative who listens, who is curious, who seeks out the facts, who engages with communities and collaborates with all levels of government. A representative who puts community before politics. I am committed to transparency in my decisions. I STAND committed to the recognition of our First Nations People through treaty or voice to parliament or constitutional reform or a combination of any or all of those things in a way that is led by Aboriginal people and helps write a new story for our young democracy which puts our first peoples at the centre rather than the margins. I STAND with all who seek to create a humane, fair and efficient process for people seeking safe haven in our nation so people can get on with rebuilding their lives in our communities. I STAND for working with the parliament of the day whoever they may be to deliver the best for Indi. My job is not to grandstand but to take a stand and that stand is for Indi and for good policy that enables rural and regional Australia to thrive rather than survive. To guide what I propose to do? I was on a factory floor the other day and a worker I spoke to there told me the most important thing to him was health and education. He had recently become a father and he wanted his kids to get a good education and to know that if they got sick they would get the best possible care in the town where they lived. Another man in the same factory told me that electricity prices were killing him and he was frustrated that as someone who rented he could not access solar power. He struggled with his bills and he cared about emissions. many mistakes and months of delays when our plans come back littered with mistakes, resulting in a review and more delays. I spoke to some café owners in Alexandra and expected to hear their concerns about small business. Instead they talked to me about the struggles their young son faced with his mental health. To get the care he needs means a trip to Shepparton. That means day off school for him and a day off work for his mother or father. And when they get there he sees a different clinician every time because the last one has left. If their son can’t get better help soon they will pack up and leave that country town. I met young people in Kinglake and they told me that they couldn’t get to their TAFE courses because there is only two bus services a day to the town where the TAFE is and the times don’t match the course delivery. We don’t just need buses to go shopping you know! Some would like to go to uni but that means living away from home and the accommodation is a cost their families can’t bear. At the same time, I have spoken to businesses in Wodonga and Wangaratta and Eildon and Benalla who are longing for skilled young people to fill their jobs and grow their business. Transport is holding us back rather than moving us along! And I have met with young families who tell me about the challenges they face in accessing affordable childcare and preschool close to where they live whether that be in Tatong or Towong, Violet Town or Cornishtown. I’ve spoken to women in their sixties who are waiting for aged-care packages to help in the care of their parents who are in their late eighties. And so many people tell me their frustration with NBN and the remaining mobile phone black spots — businesses whose EFTPOS machines are out for days, kids who need to be driven into town to get on the internet so they can do their homework, isolated people in danger of bushfire, people trying to log into the My Aged Care website so they can access some service. So much of this comes down to planned regional development. There is a big role for government to play in that and it starts with: better connectivity, better rail, better internet, better mobile phone coverage and better access to health and education. These fundamental government investments drive private investment, business growth and jobs. We — allegedly — have a party in Australia whose sole purpose is advocating for regional Australia. This party has been in government for the past six years and what do we have to show for it? They have delivered no plan to create thriving regional communities. They have delivered no long-term vision for how our communities can grow or prosper in the long term. Yes, decentralisation needs to be part of that conversation, but it’s also about transport and communications and services that are essential if we are to truly decentralise out of major cities. It’s not just about moving public servants to regional cities, it’s about integration and coordination of services. A party used to exist who did that — it was a party my parents always voted for. But that job now lies with Independents. And I will, like Cathy has over the last six years, do everything my role permits to drag along the major parties and the federal bureaucracy to recognise rural and regional Australia. The core job of the local member is to listen, and to represent. Today I put to you some key areas that I have heard when I listened and that I commit, as your representative to fight for us on. I’m going to just touch on four issues today, but over the coming weeks I’ll have a lot more to say on these and other areas. These are four issues which I hope, if elected, I couldvlook back on in years to come and say I made a difference on. I will work tirelessly as I have all my professional life for policy that recognises and responds to the distinct challenges of healthcare in rural communities such as ours. Suicide is twice as high in rural areas compared with urban areas, with males three times more likely than females to die by suicide. This is directly attributable to a lack of mental health services in rural Australia. There are significant areas of Indi where the need for access to high quality and timely mental health services is not met. Funding for mental health severely lags behind funding for physical health. We need more psychologists, mental health nurses, drug and alcohol workers and allied health professionals. In line with calls from the peak rural health body: The Australian Rural Health Alliance, I will push for funding to rural health clinical schools at our regional universities to train health professionals with an emphasis on the rural mental health workforce, including psychologists, drug and alcohol workers, and mental health nurses. Your access to mental health care should not be reliant on your postcode or your ability to drive hours to appointments. We need better investment in psychological telehealth services and the reliable connectivity that makes it work in Indi to allow greater contact and treatment and reduce the burden of travel and wait times. aged care this is such a disappointing outcome. In addition, in some of our more remote areas such as Corryong, high numbers of older persons rely on accessing services through the federal multi-purpose service funding, a revenue stream that is severely underfunded and not guaranteed. The waiting list for home care packages is unacceptable. I will lobby for additional allocation of aged care packages in Indi particularly in locations distant to our regional cities and larger towns. We need funded transport for health professionals to outreach distant clients and transport solutions for older people to travel in to services. I will work to guarantee long term federal funding for Multi-Purpose Services (MPS) which will enable surety of ongoing service delivery in our most remote locations . To every person, family and carer across Indi who is waiting in such frustration for full access to the NDIS, I hear you. The next parliament must not let its guard down and must work to ensure the NDIS lives up to the promise and hope felt by so many when it was created. The excess funds from last year’s underspend should be used to fix the NDIS’s implementation problems which are preventing people from using the scheme in the first place. Namely that no plan is submitted to the NDIS until the people whose plan it is see and sign off on the draft. We understand that people succeed when they have a chance to get a decent education and learn new skills, and, by the way, so do the businesses that hire them or the companies that they start. But this is still out of reach for many in Indi. Support of our TAFE colleges and regional universities is crucial to addressing this. And long before our kids even finish school the international evidence is clear that the best educational success comes to kids who have two years of preschool education and high quality childcare. I pledge my support to the national regional, rural and remote education strategy. This gives us the blueprint for real action. It’s great to see the Labor Party finally recognise the huge body of research that shows how critical the first two years of child’s education is. If Labor form government and I am elected I will hold them to account to ensure they deliver on this promise for all children wherever they live and most especially if they live in rural communities such as ours. And if the Liberal Party win then I will be pushing them to do the same. I will champion secure long-term funding for rural childcare to support rural families, whose options differ greatly from their urban counterparts. The communities of Mitta Mitta, Walwa, Kergunyah, Baranduda and Bellbridge should have secure access to child care just as families in cities do. We can grow our regions to a greater, sustainable prosperity. We need more than the government’s funding model for critical infrastructure that pits local government against local government for grants. Instead we need to increase federal assistance grants which have been declining since 1996, massively disadvantaging rural communities over the cities which have access to far more revenue streams. The government accepted just five of the Regions at the Ready Report’s 13 recommendations outright, and four of those were focused on the decentralisation of public sector jobs. I commit to pushing the parliament — Coalition or Labor — on the remaining recommendations, to achieve a visionary path to grow and develop regional Australia; to coordinating the delivery of jobs, housing, roads and physical infrastructure, to support a planned approach so our agriculture can thrive, so our small and large businesses can thrive, so our young people can carve out a prosperous future. And the reason is because it is well past time. We elect governments to lead. And on climate and energy policy there has been no leadership. It has claimed the leadership of a prime mMinister and torn this government apart and yet there is no policy to show for it. Has the government risen to the challenge of this climate election? In the budget last week the centrepiece of their policy, their “emission reduction fund’ was, on a per year basis, cut — from $200 million per year to $133m per year. The fact is climate change is not just a crisis, though we know it is; it’s also a once in a generation opportunity for regional Australia to lead the way. 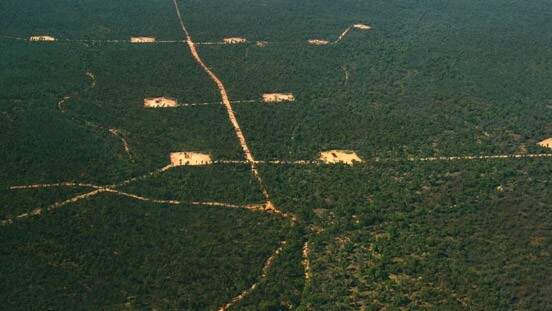 The spoils of the mining boom have been enjoyed in only a few small parts of the country. But we have the opportunity to be part of the renewables boom if we seize it. Indi has the sun, it has the hills and water, it has the skills and the smarts to be part of this boom and I am committed to working with every community, every manufacturer, every government agency to make that happen. That means a strong renewable energy target that gives certainty to investors that when it comes to clean energy, Australia — and Indi — is open for business. I will champion community energy and the incredibly innovative work being done in Indi in this area as a model for the rest of the country that can reduce power bills, reduce emissions and stimulate our regional economies. And it is for all of these things that I need your help. It’s with you that we are going to win this thing door by door, town by town, community by community. If there is one thing that we learned in 2013, it’s that nothing is more powerful than our voices. When enough of us knock on doors, when we pick up the phones, when we talk to our friends, we surprise the big guys, we win elections with the toughest of odds and make no mistake this year we are facing very tough odds indeed. This first phase of the campaign since the Voices for Indi forum has been about getting our orange team into place. And boy have we done that! – ten campaign hubs. Ten! It’s not a competition of course but I’m ready to stake a claim that no other campaign in any electorate in Australia has ten campaign offices, 1200 people signed up to the team, orange everywhere. We have orange teams ready and active in every corner of the electorate. Can I hear it for those form Wodonga? From Tallangatta? Baranduda? Beechworth? Benalla? Myrtleford? Wangaratta? Tangambalanga? Mansfield? And what about our returning people of Indi? Violet Town? Euroa and let’s hear it for Upotipotpon? And now in these next few weeks before election day we must turn our focus singularly to what will win this election: conversations. The big parties have money, but they don’t have anything like this huge orange army. They will flood the airwaves with ads but we can match them with friendly but purposeful conversation. Between now and election day our aim is no less than to have a conversation with every voter, to knock on every door. We can do it. We can win this election on the ground. We can prove Antony Greene wrong! Collectively we have a story that belongs to us all. If we are successful in following an independent with another independent MP we will have created a new story for Australian politics – one that writes us all into the history books. Which is why we’ve shown up today. We started something far bigger than we could have imagined way back in 2013. Our goal wasn’t to storm the doors of parliament in one campaign but somehow we did. But I guess that really is how you make history, many small efforts, by many people with a common purpose, often unglamorous and without credit being sought, but in culmination the impact can outlast us. Don Watson, in his book The Bush, described the people of places like ours as having inserted themselves into a crack in the nation’s development… schools, churches, halls, hospitals, agricultural shows, libraries, mechanics’ institutes. A persistent effort in the small things, says Watson, that laid down a lasting pattern in Australian rural life. The hamlets and towns of Indi tell such stories of good people, persistent effort and small things. We have inserted ourselves into a crack in our nation’s development. Our job now is to hold it open, build on it, fortify it. 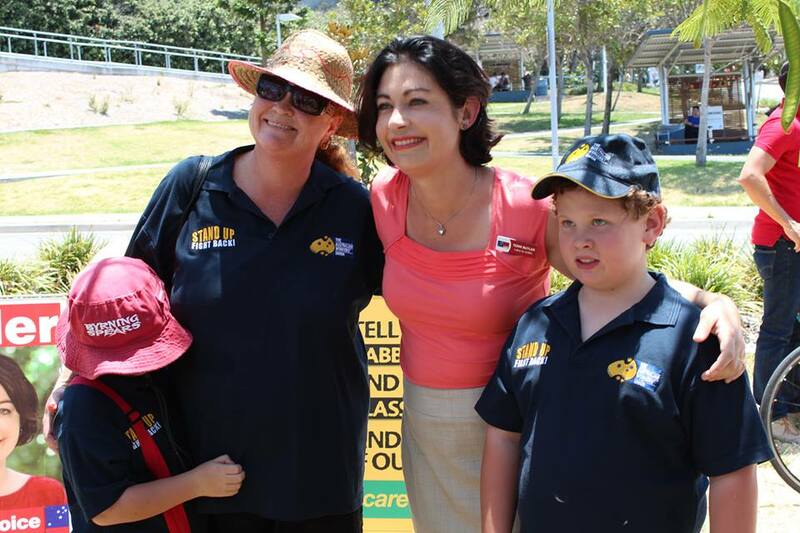 Cathy has blazed a remarkable trail as our first community federal representative. I seek to keep that trail open for the next person to come too. I have strong hands to pick up the reigns and if in a few weeks time the people of Indi entrust me to do this job I commit to give it not just my hands, but my heart and my head. Thank you to each and everyone one of you for what you’ve done before, for what you are doing now and for what I know you will do to write this story for Indi. This is our story.